I’m able to trace my mother’s side of the family back to the Middle Ages in Switzerland, hence (love using that word whenever I can), I’m totally appreciative of tradition. As you know, that is especially true for art. For one thing, I don’t think art can be created in a vacuum: every work of art builds on something from before. What I find really charming is where the tradition of an art form is a conscious aspect of contemporary work. Nowhere is that more apparent than in ceramic arts in Japan. The history of Japanese ceramic art is a long record of development that began in the Neolithic period (ca. 3500–1000 bce). I have shown you an example of the oldest ceramic tradition known on Earth, a pot from the Jomon culture (ca. 3000–200 bce). Jomon pots, with their incised and applied coil decoration, are the first instance of ceramics being decorated purely for aesthetic rather than utilitarian purposes. The combination of utility and beauty has been a constant feature of Japanese ceramics to the present day. The artist featured this week, Shōzō Michikawa, states that no matter what kind of decoration he concentrates on, he always makes his pieces functional, since ceramics have been a part of daily life since forever. Shōzō was born in Toya, Hokkaido and studied at Aoyama Gakuin University in Tokyo. Initially he worked as a businessman in the 1970s. He discovered an affinity for ceramics after taking evening classes, and in the late 1970s he gave up the business world to become a full-time ceramic artist. Although the folds, wrinkles, and faceting of his works would seem to be sculpted, Shōzō works his pieces up on the wheel. His unique, unconventional forms, although modern in aesthetic, definitely relate back to forms in nature. This bowl, for example, almost looks to me as if it is a cabbage head opening up. Shōzō established his studio in Seto, Aichi. Seto has a 1300 year tradition of ceramic art. In the Kamakura period (1185–1333), the first glazed stoneware was produced there. It is known as one of the Six Old Kilns, and is the oldest ceramic center in Japan. Historically, Seto stoneware is coarse clay, usually decorated with carved or incised designs. Shōzō’s work admirably highlights the particular nature of the regional clay. The kohiki glaze, white slip (clay mixed with water) with a translucent glaze, was introduced by Korean potters centuries ago. 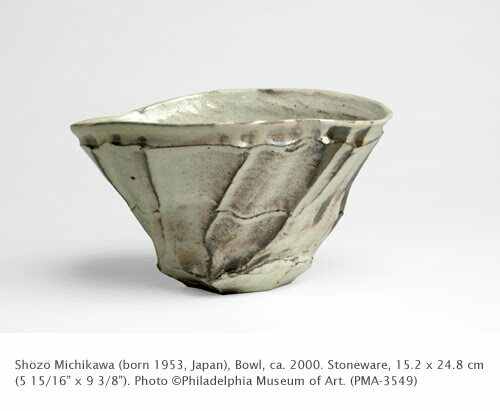 Check out other examples of contemporary Japanese ceramics in the Davis collection. Learn more about Shōzō Michikawa and his work on his website.